Insect refrigerator magnets include a bumble bee, butterfly, dragonfly, garden fairy, ladybug. The insect fridge magnets can be custom-painted and personalized for handpainted personalized gifts. Insect magnets include a Bumble Bee, Butterfly, Dragonfly, Garden Fairy and a Ladybug. 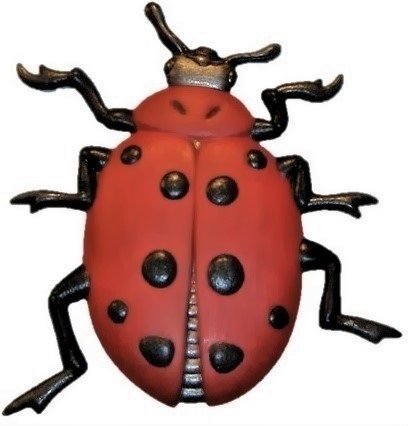 Each insect fridge magnet has a very strong magnet attached to the back and the large pieces will have 2 magnets. These decorative and functional pieces will make unique keepsake gifts, custom-painted collectibles and customized handpainted decor. By adding names, dates, custom-painting, these pieces become unique and personalized. Every piece will be signed, numbered and dated. Customizing, personalizing services is free of charge, excluding elaborate finishes i.e., gold leafing. All pieces are made of stamped steel and made in America.